A young Rohingya refugee walks back home at the Balukhali refugee camp, Ukhia, Feb. 4, 2019. The risk of being trafficked in Rohingya camps has recently increased as many desperate Rohingya refugees is seeking for a way out of worsening humanitarian conditions. 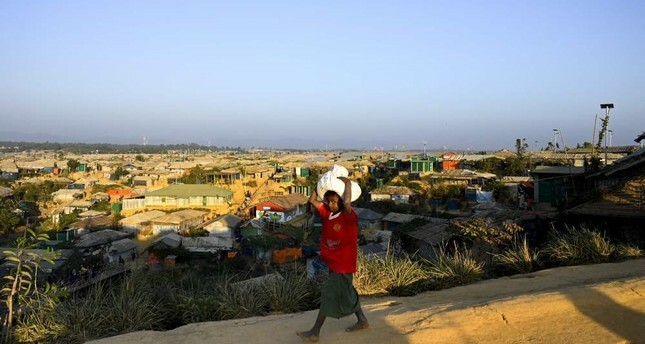 Jishu Barua, program coordinator for Young Power in Social Action, a non-profit group that deals with trafficking, said an analysis of local papers suggested at least 200 Rohingya had been rescued in the last three months. "The numbers have increased. We are telling everyone in the camps to be more careful. We are spreading awareness through different events, such as street dramas and courtyard briefings," Barua told the Thomson Reuters Foundation. The United Nations' International Organization for Migration (IOM) has identified about 204 cases of trafficking so far. "But this is just a fraction of what we believe is happening," said IOM spokeswoman Fiona MacGregor, adding that young girls were particularly vulnerable to being taken as domestic workers both locally and within Bangladesh. "There are cases where people don't know what is going on and then others that do take the risk because they feel there is no other choice." Anti-trafficking groups fear the human trafficking routes to southeast Asia through the Bay of Bengal, which became active around 2010, are now being used to smuggle increasingly desperate Rohingya refugees out of Bangladesh. Last November, law enforcement agencies rescued 57 Rohingya refugees from Malaysia-bound boats on three different occasions. For there are no signs the Rohingya will be able to leave the camps any time soon. Plans for repatriation were put on hold by the Bangladesh government last November amid protests in the camp with a vow no one will be sent back against their will. In the past, traffickers misled hundreds of people who wanted to go to Malaysia and trapped them in camps in the border areas of Thailand and Malaysia, torturing them until their families agreed to pay up to $1,800, a fortune for impoverished migrants. This came to light in 2015 with the discovery of scores of mass graves believed to contain the bodies of Rohingya and Bangladeshi migrants.